Well done Abby Harris for correctly identifying the three characters painted by Isobel as Jeanne (goose), Mimosa (cat) and Louna (bee). 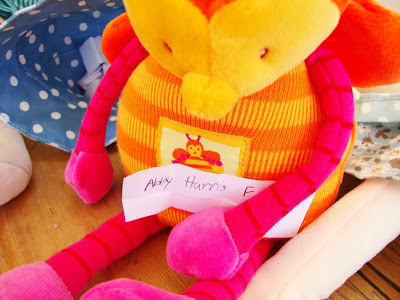 Isobel wrote out the correct entrants names on Saturday evening and we assembled the three characters to supervise the draw. You can see Louna bee holding the winning name in the photos. 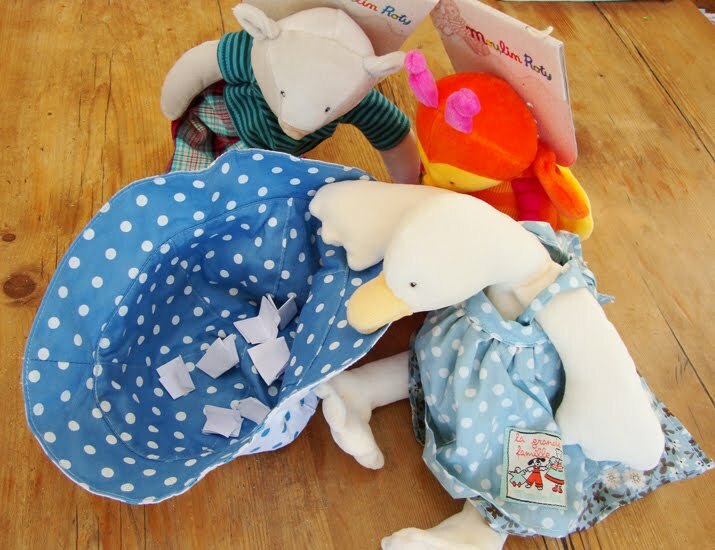 Well done Abby and please email me your address so I can send you something nice - charlotte@cottontailsbaby.co.uk. Have a look at Abby's lovely blog over at Mutterings from the Moor - she has a lovely creative blog header which I was talking about today in my creative textiles course! ooooh! It must be my lucky day, that's the second competition I've won today! My husband has just ordered me to buy an extra lottery ticket this week just in case! !